Korean workers can now seek a harmonious balance between work and family life, as a new labor law went into effect on July 1 to reduce the maximum weekly working hours from 68 to 52 hours, resulting in a reduction of 16 hours. The new workweek system, like the introduction of a five-day workweek in 2004, will bring about a major change in Korean society. Here is Lee In-chul, director of the Real Good Economic Institute, to examine the new 52-hour workweek. 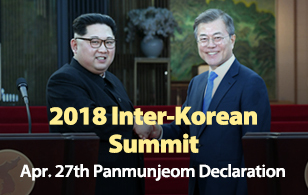 Reducing work hours was one of President Moon Jae-in’s election pledges. The government plans to lower the nation’s annual working hours to the range of 1,800 hours, about the OECD average, around the year 2020. Starting this month, companies with 300 or more workers must reduce the maximum working hours to 52 hours per week—40 regular work hours and up to 12 hours in overtime. Firms with 50 to 299 employees are required to implement the system from January 2020, and companies with five to 49 will be subject to the regulation from July 2021. The shorter working system was introduced to provide working Koreans with quality evening time and improve labor productivity. Thanks to the remarkable economic development, which is described by some as the “Miracle of the Han River,” South Korea is expected to achieve per capita income of 30-thousand US dollars soon. However, the nation’s notoriously long work hours have shown no signs of improving. Koreans work an average of 2,052 hours a year, well above the OECD average of 1,707 hours. Despite the long work hours, Korea’s labor productivity lags far behind that of other OECD members. Koreans earn an average of 34.40 US dollars per hour, 17.60 dollars fewer than the OECD average of 52 dollars. Long work hours lead to a work-life imbalance and more stress, making workers lose their drive to work and decreasing productivity as well. To improve the quality of life and boost productivity of workers, the Korean government decided to shorten work hours. Mr. Lee says that the reduced working hours will create more jobs. The government and the labor community are expecting that the shorter workweek will generate new jobs, since companies have to hire new workers to meet their production goals. The National Assembly Budget Office estimates that 125-thousand to 160-thousand people will be hired as companies have to fill the 6.47 million vacated working hours. Similarly, the Korea Labor Institute expects that the 52-hour workweek will generate the effect of creating 111-thousand to 193-thousand new jobs. The government expects that the new workweek will create up to 180-thousand new jobs. More leisure time may increase consumption and invigorate tourism and education industries. Having these benefits in mind, large companies have already introduced various working systems in preparation for the 52-hour workweek. Mr. Lee cites some examples. Samsung Electronics, which is South Korea’s largest company, has rehearsed the 52-hour workweek since last October. The firm has also introduced a new working system since January 15 this year to slash non-work hours effectively. Under the new system, time for a coffee break, smoking or relaxing is excluded from work hours. Also, heads of teams and parts of the company receive poor ratings in their performance evaluation if members of their teams work more than 52 hours a week. Samsung has run the flextime system. Employees of the company usually work from 7 a.m. to 4 p.m., but they are allowed to decide on their own working hours for the coming month, as long as they work the required hours. On a similar note, LG Electronics has implemented the 40-hour workweek for its office workers on a trial basis since February this year, and has expanded the 52-hour workweek to all workers in production lines since March. Workers at LG Display can take a day or days off during weekdays if they have to work on weekends. Large companies in Korea are trying various working schemes, including flextime, a discretionary system where employees can adjust their work hours with their managers, reform in the work shift system and additional hires. Some companies strictly separate work hours from break time, close the smoking room or shut down personal computers after working hours. But the problem is small-and mid-sized firms. Mr. Lee explains. Both employers and employees at small-and mid- companies are worried about the new workweek system. Employees are concerned that their income might be reduced, while employers are afraid of increasing labor costs as a result of new hires. 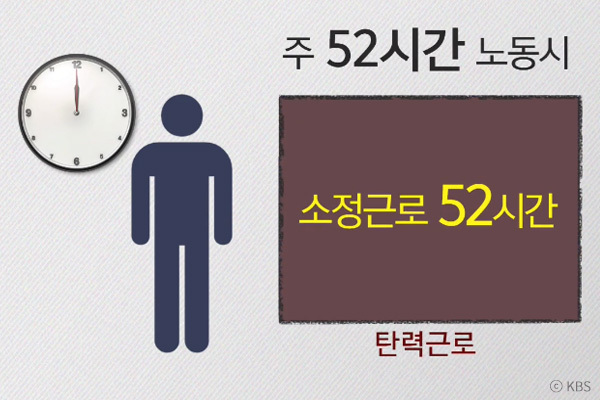 According to the estimates of the National Assembly Budget Office, those who used to work longer than 52 hours a week will see an average cut of 377-thousand won, or 11 percent, in their monthly salary of 3.28 million won under the new system. Employers, on their part, have to shoulder the burden of higher labor costs. The Korea Small Business Institute says that the shorter working hours will cause additional labor costs of 12.3 trillion won a year, with small firms with fewer than 300 employees bearing 70 percent of the burden, or 8.6 trillion won. Some companies, including construction firms, find it difficult to change their working systems. Construction is heavily influenced by weather, as work tends to slow down on hot days. In that case, it is difficult to meet the deadline. If working hours are slashed drastically in this situation, workers will be pressed for time to give rise to safety concerns at construction sites. For the industry dealing with international finance and the information technology sector, which are running around the clock, it is essential to prepare for an alternative to the 52-hour workweek. For these reasons, there are growing calls for supplementing the new system in the initial stage of implementation. Here again is Mr. Lee. It is the question of cost, after all. Even small-and mid- businesses as well as large companies will inevitably cope with the issue of high labor costs. There is controversy over the government’s use of taxpayers’ money in the early stage. I agree on the view that the government’s subsidy is only a desperate attempt to stabilize the new system in the initial stage and should not be used as a means of solving the problem. To minimize the side effects from the reduced working hours, it is necessary to boost productivity and therefore reduce wage cuts. Labor, management and the government should cooperate and play their respective roles properly to ease possible social conflict and confusion triggered by the new system. For that purpose, the government should present clearer guidelines and consider the distinct characteristics of some industries by offering a certain grace period for the new law and expanding the implementation period of flextime. If the past is any guide, the five-day workweek in 2004 came with many trials and errors. Moreover, the new 52-hour workweek system is proceeding much faster than the five-day workweek. To cushion the blows of the new regulation, the government recently offered a six-month grace period for the enforcement. There are both expectations and concerns over the shorter working hours. To alleviate worries and raise hopes, the government, companies and workers should put their heads together to find a proper solution.